I went to a party the other day, and wanted a cool nail look to wear. I took inspiration from a great YouTube video by Chic Pretty Nails. 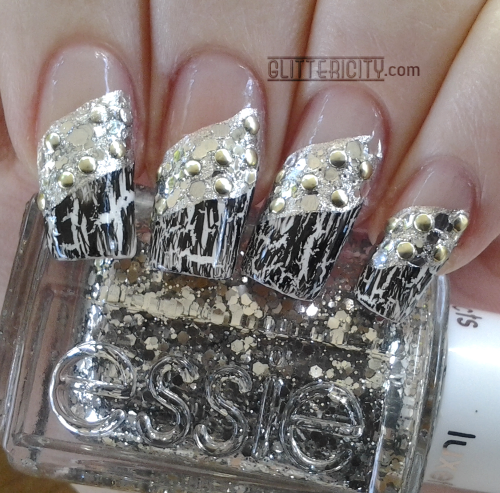 Crackle polish, glitter, and studs make for a badass yet chic mani! In the inspiration video, she uses purple polish for the tip, and gold polish/studs for the centre stripe. 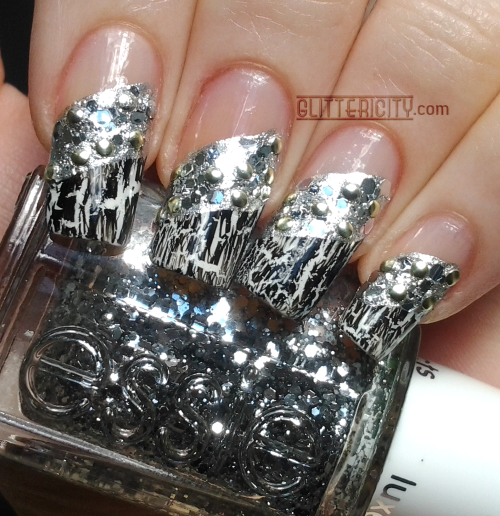 As you can see, I went with a black & white look with silver accent! First, I painted a diagonal tip with Ulta Snow White, a plain white creme. Once that was fully dried, I added China Glaze Black Shatter. Below that, I used Revlon #928 Silver Dollar to swipe on a second diagonal stripe. Once that was dry, I added Essie Set In Stones (big chunky bright sparkly silver glitter), then some small silver studs and glitters, both from Born Pretty Store. If you haven't already done so, watch the video to see the technique! Finally, I added two coats of Seche Vite topcoat to smooth it all out and give it that lovely glassy shine. I just love the street-grunge vibe this has going on! Outdoors in shade. The studs look a bit gold in some lights. Outdoors in sun. They are so bright and reflective! Thanks for the inspiration, Chic Pretty Nails! I think this is an idea I will revisit with different colours in the future. Such a cool look!